Focusky can help you to publish your projects in different formats, which can be read online or offline. This tutorial will show you how to publish your presentation projects in Focusky. In Focusky, you can not only create an interactive presentation with the help of rich multimedia but also publish them in different formats including Publish to Cloud, EXE, Video, HTML, MAC OSX Application and ZIP format. On the one hand, when you directly upload your projects to Focusky Cloud Platform, you can reach your presentation files anytime anywhere. On the other hand, if you publish them in other format, you are able to save your projects on your local computer and present them offline. 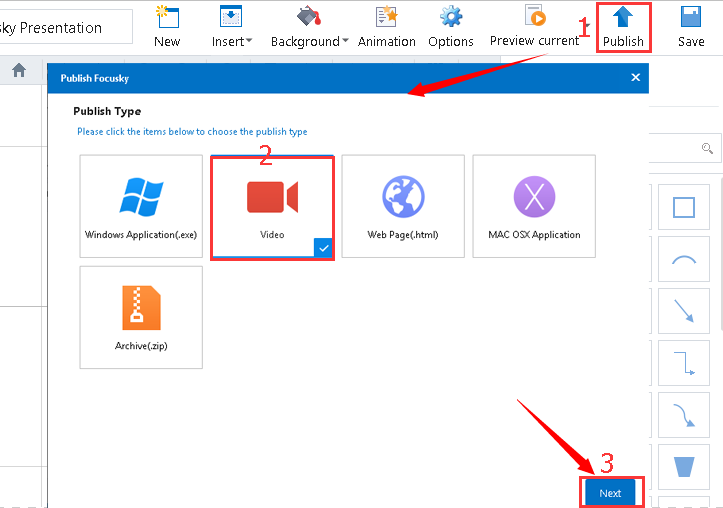 Click the "Publish" button to go to the Publish Type interface, and then check the option of "Video" and finally click the "Next" button to enter the Video editing interface. Firstly you need to choose a file to save your project. 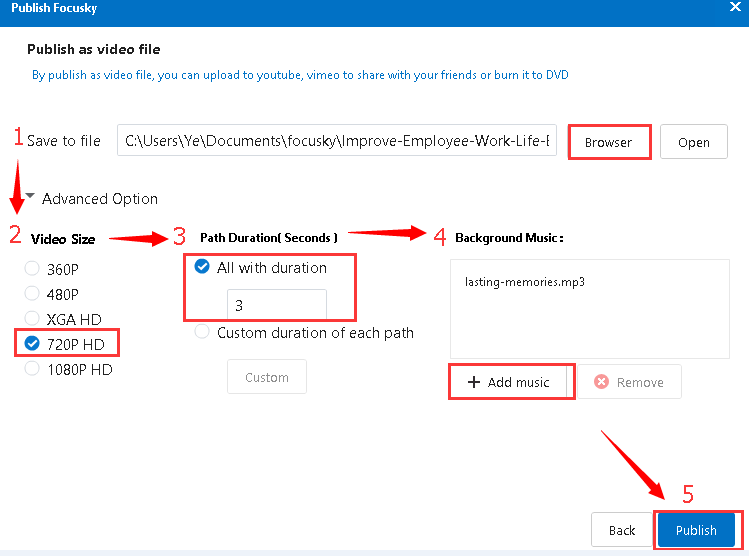 Then you need to customize the Video Size (720P HD), Path Duration (All with duration 3) and Background Music (Lasting Memory) one by one. Finally please don't forget to click "Publish" button to publish your presentation project. After publishing your project successfully, you can click "View the presentation" button to watch it in your browser. Note: Whatever formats you publish, you can view your presentation directly without installing Focusky.